Hiring porter service in Venice is like buying a yacht: If you need to ask the price, you can't afford it. ABOVE: Travel light (or store unneeded luggage at a deposito bagagli office), and you won't need to pay painfully high rates for porter service. Rates for hauling your bags are stratospheric, in part because getting from point A to point B in Venice is a slow, painful process for the men who wrestle luggage trolleys down narrow streets and over the steps of Venice's 400+ bridges. During the main tourist season or on busy weekends, it's easy to find baggage porters in front of the Santa Lucia Railroad Station (near the water) or in Piazzale Roma, where airport buses and land taxis arrive and depart. 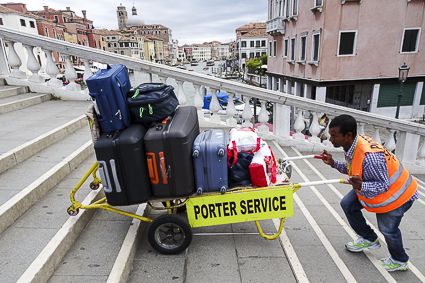 Porters in Venice's historic center aren't regulated as they once were, and rates for independent baggage porters can be hard to pin down. Depending on distance, you could easily pay 50 euros or more to have several bags hauled from the railroad station or the Piazzale Roma to your hotel. If you want a rate quotation in advance, we suggest placing an inquiry with the Cooperativa Trasbagagli Venezia, a.k.a. the Venice Baggage Transportation Cooperative, which has a contact form on its Web site. Our advice: Avoid the need for porters. 1. Stay at a hotel near your point of arrival or departure. If you arrive or depart by Alilaguna airport boat, book a hotel near an Alilaguna stop in central Venice. If you arrive or depart by airport bus or land taxi, stay near Piazzale Roma. If you arrive or depart by train, stay at a hotel near Santa Lucia Railroad Station. If you're cruising, see our Venice Cruise Hotels and 9 Hotels Closest to Cruise Ships articles. 2. Travel light, or park unneeded luggage at a deposito bagagli office. Limit yourself to a rolling suitcase of moderate size (preferably a two-wheeled model, for easier handling on bridge steps) and a small backpack. If you can't avoid traveling with multiple bags or large suitcases, pack what you need for Venice in a small bag and park your bigger cases at a "left luggage" office. If you arrive at the railroad station, please be aware that the porters by the water are not official station porters (a.k.a. "redcaps," as we used to say in the U.S.). And while most are just honest porters looking for work, you may encounter scumbags who take advantage of unwary visitors. "I would like to recommend that you include something regarding the unscrupulous porters at Santa Lucia train station. They cleverly position themselves at the water taxi jetties / piers and 'discuss' a price with a water taxi driver 'on your behalf,' cleverly fooling you into thinking that both they and the water taxi are all part of the same service. They then offer you a price to your hotel, commonly €60 and then offer to collect your luggage, in our case this was at the station with family members. "What they don't tell you is that the collection of your luggage is not included in the water taxi fare. They charge €15 for the first piece and then €5 for each additional piece. This only becomes apparent after they have dropped it off at the water taxi. "When we refused to pay, as they had not informed us of this or quoted a price to us, they threatened to transport all our luggage back to the train station. We had a number of large bags with us having traveled to the Tuscan region for a wedding. After much haggling we agreed to pay half of what they wanted to avoid an increasingly nasty situation from escalating any further."